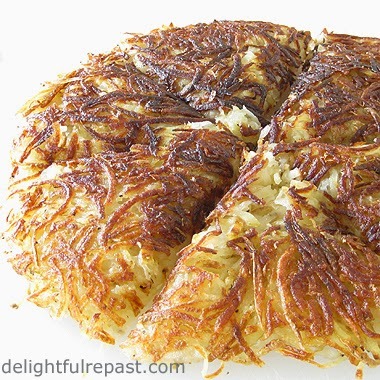 Delightful Repast: Pomme Rosti - Hash Browns with an Attitude? Sometimes I wish I had not given up potatoes as too little return for too much of what I don’t want to eat (forgive this ex-patriot, Ireland). Your column sounds good, looks good…I think I can smell the potatoes and they even smell good. As an aside – potatoes are always an aside – the former chemical engineer student in me wants to believe that temperature and quick searing had something to do with the easy slide of your repast out of the pan. Just sayin’. Yes, Sully, I think that is the key. Potatoes (or meat or anything) are going to stick to the pan if you the temperature is too low or if you start turning or stirring too soon. I waited patiently for the right time with the Pomme Rosti, but I always get in a "short-order cook" hurry with mere hash browns! I've never made these, but have enjoyed the efforts of others. And, Jean, the photo you posted of your finished dish is one of the most mouth-watering I've ever seen of a potato dish! Thank you so much, Pauline! Potatoes are so wonderful, but they *are* rather "plain Jane" looking! Haven't made these... yet. Wonder how they'd turn out in my cast iron skillet, hmmm. Everything you make looks so delicious! Thank you, Nicole! I love it when someone says I gave them "food inspiration"! Jacqueline, thank you! I think this would be fine in your cast iron as far as sticking, but it's a little easier sliding something out of a slope-sided skillet than a deeper one with higher sides. But give it a try and let me know how it turns out. Your tip about foil on the back of the stove is brilliant! How have I never thought of that!?!? A blast from my past which set my mouth salivating. I could, and do at times, live off of potatoes! Yes---hash browns in my book, but I like the attitude. Love to cook---don't do much of it anymore with only me to feed. Thank you for stopping by my place & I'll be back. It is almost as much fun to read the recipes as to cook! Thanks, Lulu! Your "It is almost as much fun to read the recipes as to cook!" is soooo true. On days when I'm ill or too tired to cook or something, I fill the desire by reading about food or watching food videos. Jean, it doesn't matter to me how potatoes are fixed, hash browns, baked, mashed, fries, potato chips....I'm a potato nut. Linda, we'd get along fine then! It's all potatoes all the time around here! Splendid looking potatoes, Jean. I like attitude! I MUST make this for my parents in law next time when they visit us. It looks beyond delicious! Thanks, Greg! 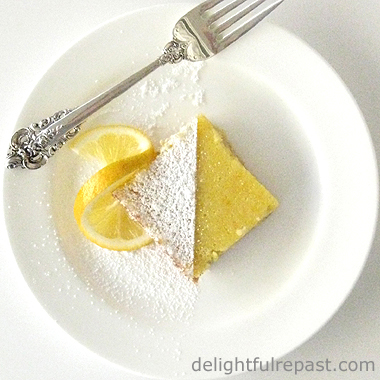 I think it would go great with your spinach stuffed roast salmon! Brooks, thank you. Yes, a humble potato with attitude! Thanks, Angie! Let me know how they like it! This looks delicious, Jean. The video is very instructive. We have a long tradition of using potatoes in the Norwegian cuisine. (I didn't mention potato lefsa which I don't like.) Will try this out. Thanks for inspiration! Thanks, Jan! I've not heard of that dish, I'll have to look it up. I'm always interested in learning about new (to me) foods. Hello dear Jean! I have spent the past half hours perusing your beautiful, delicious posts!! Love the name of your blog too. I sent your link to 3 of my non-blogging friends that love to cook. Have a wonderful weekend, Jean. Choclette, thanks! I don't know if they're exactly the same thing, but close. I'm going to make some more very soon. My favourite potatoes are Jersey Royals, Jean. Do you get them in the States? They have a very nice distinctive flavour. The compost used to grow them is made with seaweed gathered from the beaches of Jersey. During the war, when the Germans occupied the Channel Islands, they took all of Jersey's best root potatoes back to Germany. Centuries of developing the Jersey Royal was lost. The people of Jersey had to start again developing the potato after the war. Jersey had a terrible time in the war.. The people were virtually enslaved and in a way the whole island became a concentration camp. Along with the people of Jersey, prisoners of war were brought over to Jersey to build the enormous concrete defences and gun emplacements the Germans constructed for the their so called Atlantic Wall. Underground hospitals were built too. Jersey is a beautiful island. My parents went there every year for years after the war, on holiday. It has beautiful beaches and rocky cliffs. However its dark past is around every corner. You can visit the underground hospitals and the great German defences to this day. The potatoes are doing well again though!!!! Ha! ha! Thank you for sharing Jersey's WWII history. That is not taught in the schools here and I had never heard of it until the British television series Island at War came out here. My husband got tired of hearing me say "Why were never told about this?!" for weeks afterward. Philip Glenister, well, the entire cast really, were marvelous. Jean these look easy and very good! I am going to put some of this flare of yours to work in my kitchen. Thanks for sharing at Anything Goes! Thanks, Marilyn! Everybody loves a potato! I don't think any one could be a potato snob, it's just how we are ;) Your hash browns look awesome. April, I'm so sorry you've been ill. I hope you'll be all well very soon and stay that way! Let me know how the rosti turns out for you. Definitely a big potato fan here! I'm not very patient I must admit though, and usually my potato pancakes turn out mushier than I want. I know these are hash browns (gourmet hash browns), but the concept in making them starts the same. 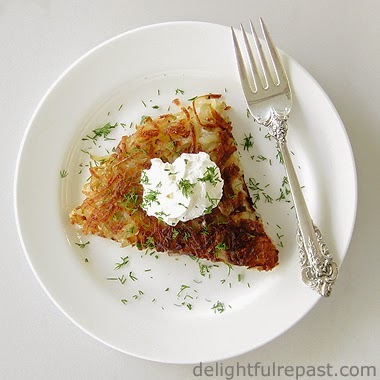 I need to work on this, because I love hash browns and potato pancakes! Michelle, thank you! What I like about this is that once you pick your pan, pick your heat setting and use the same amount of potatoes, you can actually just set the timer and forget it. And that really helps with the 'getting impatient' part that I'm famous for! Delicious Jean, Hash browns are my favorite, this version sounds interesting. Thank you, Swathi! Aren't potatoes the most wonderful and versatile food! Yes, it's awful, PP! Every extra ounce on me is due to potatoes or bread (I'm not all that sweet on sugar)! 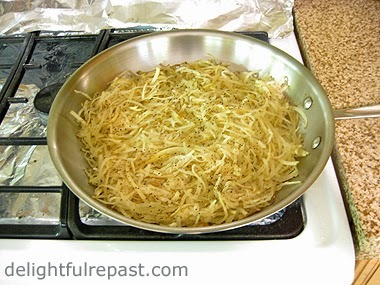 Ok I have never been able to make hash browns, fresh or frozen. It comes out a big mess. I'm going to try this recipe and will let you know how it goes. Pat, I'm so glad you're going to try it out and let me know how it goes! I can't wait to hear! Hoping for the best! Pat, glad it all worked out in the end! Did you heat your pan really really well, for several minutes, before putting the buttered potatoes in the pan? You should be using *medium-high* heat rather than "nice and slow" or they won't brown. Let me know how your next batch turns out!